Recently a reader sent us a link to the photos posted today from an event that occurred in 2015 and passed under our radar. 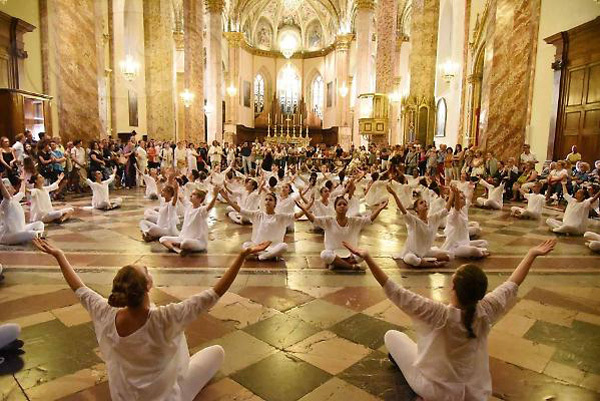 It is a performance of a group of dancers of both sexes, mostly young women, inside San Lorenzo Cathedral in Perugia, Italy. The performance took place in three distinct places on August 2, 2015: one in the morning in front of Santa Maria degli Angeli Basilica in Assisi, one in the afternoon on the central square of Perugia (a 30 minute drive from Assisi), and the last inside San Lorenzo Cathedral. The performance, titled "Table of Silence Project 9/11," was conceived by American choreographer Jacqulyn Buglisi for the 10th anniversary of the 2001 terrorist attack against the Twin Towers to honor the victims. Since then it has been repeated every year in New York City. This performance was then taken to Italy, thanks to a collaboration between Buglisi and Italian artist Rossela Vasta, who promoted it in Assisi and Perugia. The pretext for this Italian display was to lament all the violence in the modern world and to express solidarity with the victims of injustice. Putting a somewhat exaggerated spin on the event, the Italian collaborator chose to bring the whole American group of dancers to her city on August 2 because it is the "Day of Pardon of Assisi." This local feast celebrates the indulgence St. Francis received from the Pope Honorius III in the papal court in Perugia. The Pope granted a plenary indulgence to those who visit the Portiucula on that day. Although it would be desirable for the performers to be more appropriately dressed, we have no objection – quite the opposite – to honoring the victims of the terrorist attacks of 2001. Nor do we have objections against the Perugians and Assisians commemorating an important historical day. The problem starts when a secular play of this type is performed inside a church, a place that should be reserved for the worship of God. This is not appropriate; even more, it is a desecration of the sacred place – unfortunately, just one more among the enormous slew of desecrations and blasphemies we are witnessing inside Catholic churches promoted or permitted by progressivist religious authorities. It is lamentable to see that even works of art conceived for commendable goals are being used to destroy the sacrality of the House of God.